Novartis announced the launch of the STEP (Solutions to Empower Patients) Program™ to help find solutions for people living with advanced/metastatic breast cancer (MBC) as they navigate a path in their care. At Novartis, we are dedicated to helping patients and are committed to delivering new ways to help improve people’s lives. We know that an MBC diagnosis can be overwhelming and people living with the disease face multiple, unique challenges in navigating care and accessing social support. 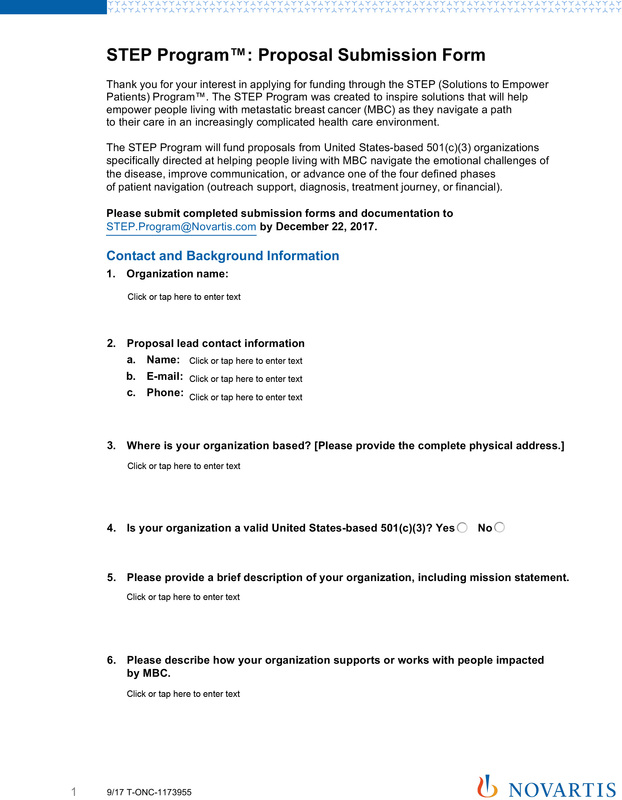 The STEP Program is seeking to fund US-based MBC patient advocacy organization initiatives because we value the critical role they play in ensuring awareness of the disease and providing programs, support, and services for people whose lives are impacted by it. 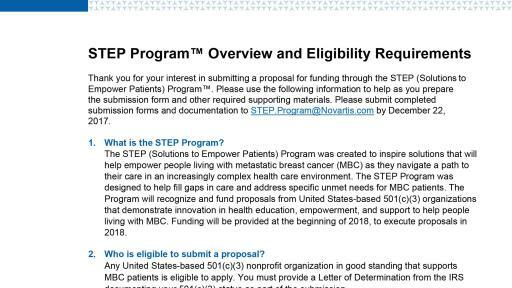 The STEP Program will recognize and fund proposals that demonstrate innovation in health education, empowerment, and support to help people living with MBC. Patient advocacy organizations are invited to submit proposals for programs, services, or tools directed at helping people living with MBC navigate the emotional challenges of the disease, improve communication, or advance patient navigation. Funding recipients will be evaluated by an external review committee. The committee consists of experts in fields including psycho-oncology, advocacy, and nurse navigation, as well as a caregiver representative. This committee will review the applications and evaluate and identify the most innovative proposals that have the greatest potential to make a positive impact on the MBC community. Please reach out if you would like to speak with a Novartis representative about this program. 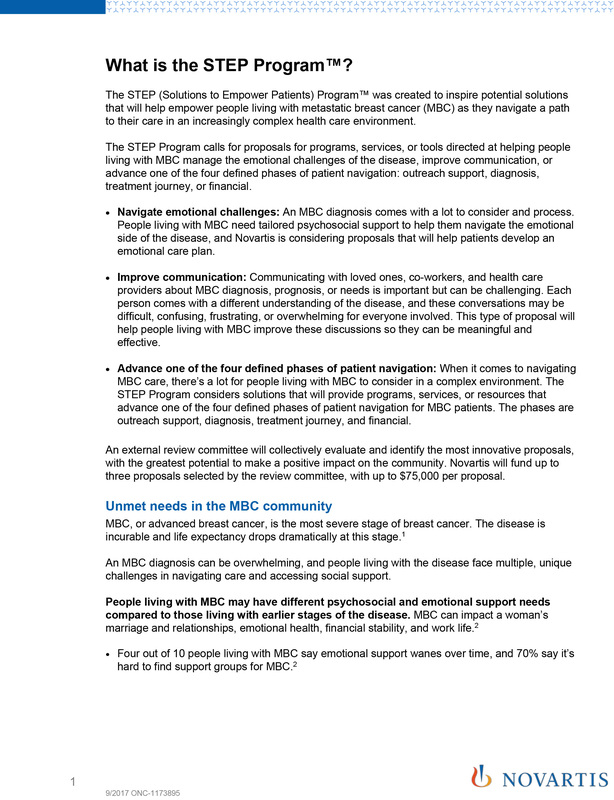 Any US-based, 501(c)(3) organization that supports people impacted by MBC is welcome to submit a proposal. 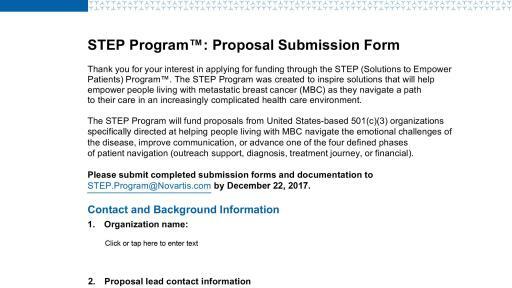 Organizations that wish to apply for funding from the STEP Program should send the submission form to STEP.Program@Novartis.com. All submissions must be received no later than December 22, 2017. 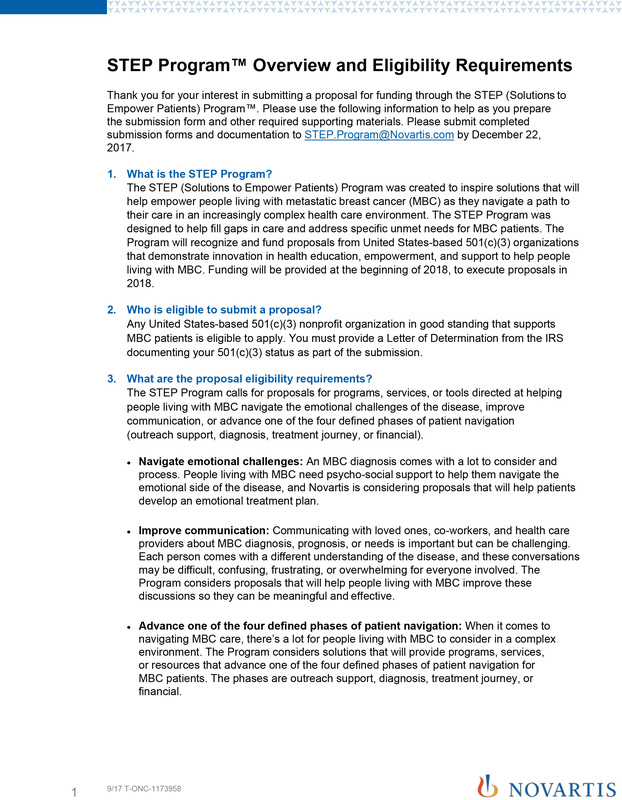 For more information, please see the submission form and program overview and eligibility requirements document to learn more about the STEP Program.